Matthew Paris was a monk of St Albans' Abbey, from 1217 until his death in 1259, about whom we know a great deal: he was a prolific chronicler of national and local events, from which we can learn a lot about him. Manuscripts such as this, in his own handwriting, demonstrate his interest in, and aptitude for, subjects are varied as geography, heraldry, and history, as well as his considerable abilities as a draughtsman. At the beginning of he manuscript are a series of miniatures depicting the early rulers of England. 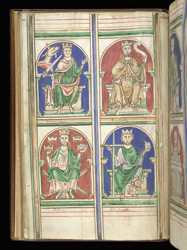 The second of these pages shows Kings Uther Pendragon, Aethelbert, Arthur, and Oswald.